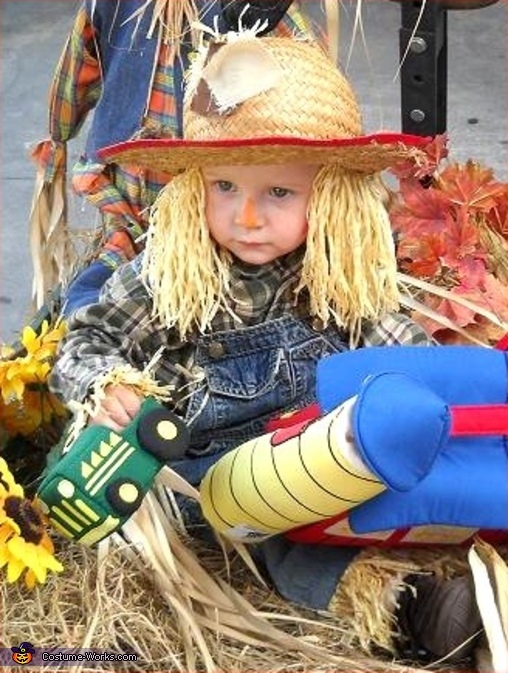 This is 2 yr. old Tyler as,"Our Little Scarecrow" as titled by Mom, Tonya. Mom's secret weapon (and FANTASTIC idea!) was to use straw from an old "Hula Skirt" as Tylers stuffing around wrists, pant cuffs, and under hat. Tonya utilized the second-hand store for clothing items that she didn't have on hand. A bail of hay on a wagon and they had the perfect hayride backdrop to decorate with gourds, corn, etc. and even added a little store-bought stand-up girl scarecrow. Whew! Even us hangin-around Scarecrows get a breaktime in this heat! Time ta take our shoes off, our hats off, n' kick back a spell. VERY creative Tonya and Cute as can be! Thanks for your entry and Best of Luck!